What would happen if the United States Air Force detonated a nuclear bomb on the Moon? In the late 1950s researchers actually considered that exact premise. What they determined is that a standard A-bomb would only create a “microscopic” explosion on the moons surface. The group even considered whether or not it was even possible to blast the moon out of orbit, causing many catastrophic issues on Earth. So could we actually blast the moon out of its orbit? 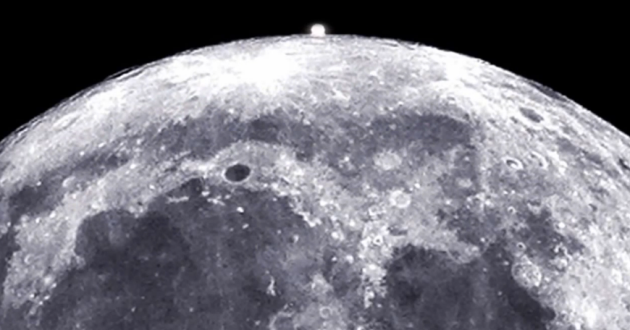 According to the military’s study, it would take somewhere in the range of 10 billion and 10 trillion megatons of TNT to cause the Moon to leave its orbit. Putting that number into perspective, the most powerful nuclear device ever detonated was the the Soviet Union’s “Tsar Bomba,” which yielded the energy equivalent of 50 megatons of TNT. If we detonated every single nuclear bomb on the planet we would still only generate 7,000 megatons. If you are worried about the moon leaving Earth, you should know that it is already edging away from our planet, but at a very slow rate. On average, the moon floats 3 or 4 centimeters further away every year. The moon’s pull drags a portion of the Earth’s water out of its natural position, creating bulges at each end of the planet. As Earth rotates, these bulges exert force on the moon, adding to its kinetic energy and adding to the growth of its orbit. If the moon was to fly out of orbit it would be disastrous to our planet. Earth would teeter on its axis, seasons would no longer be constant, and eventually over time our planet would topple over. Just take a look what happened to Uranus, it now orbits the sun on its side. So could the moon be blown out of its Orbit? Sure! But you would need way more nuclear weapons than currently available and that means a lot of weapons grade plutonium.